" A space at work"
Actually up to now I have no complaints about the program, its windows or workspace is very easy to manipulate. I recommend 100% to Spaces because it is a very good option, apart from organizing your work, making notes at hand, you have enough space in the cloud to share any type of information, files or folders, whether you are on the PC or The mobile phone is already an advantage and it is very easy to use. From what I have visualized and worked, you can send or share job information, either with clients, suppliers, colleagues and even information on social networks. You do not have to rewrite information or to get it to them. "Spaces are great for productivity"
The three main environment in Spaces are very helpful for getting information in a glance and even if my account is full of notes and notebooks of different kinds, Spaces makes me feel calm and in a clean place where I can find details quick and without wasting time and energy on searching. There is little customization options. I would like to have a drag and drop option to organize my space and may be some color coding options as well. Try it. It is worth. In the beginning is not so intuitive how this tool will change things, as already Evernote is good at collaboration. However the powerful overview and dashboard does changes things and makes you productive. Spaces is great for personal organization and collaboration. I am solving data integrity issues by having Spaces with my team and sharing information there. What Note-Taking Management solution do you use? "Excellent Tool for Collaboration & Project Management "
Currently, there are a lot of platforms being marketed to help with collaboration of projects in the workplace. I have worked with several in the past, including such as Microsoft Teams, but I feel Evernote Spaces was the best platform. It took a note sharing site, and transformed it into something my colleagues and I could use to easily exchange ideas and monitor workflow. My only negative comment would be that it was difficult to share information with others who were not on the same platform. While it was not too much of an issue as ultimately my whole team was using it, whenever we needed to send any information to an external source, the process was tedious. However, I realize that Evernote as a company has done a good job in addressing previous issues and I am sure there will be a solution soon. You can compare it to other software such as Microsoft Teams or Sharepoint, and make your decision from there. 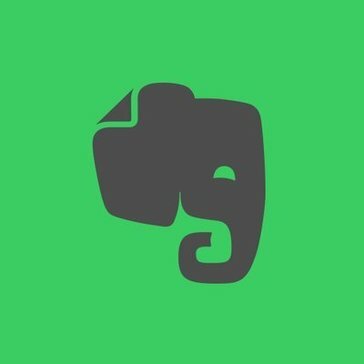 If you have used any basic Evernote product in the past, this is a great option and my understand is it was also well-priced. In on boarding some new projects within the last year, Spaces was the biggest asset in helping our organization from start to finish. We were able to exchange files and other information, communicate effectively on the platform and keep tabs on each individuals part of the project. We did end our services with them once our projects were complete, but it was a software i would recommend to anyone in a project management role. I am sure there are additional benefits we may not have explored that can be useful to other areas of business. "Easy Collaboration but Free Version Is Good Too"
I can easily share portfolios with ideas/links/pictures/docs with clients and employees. They can make changes and give feedback. I'd like to be able to share groups of notebooks with clients/students rather than each one individually. I wish there was a way to attribute changes/notes to a certain collaborator. Right now, we just use our initials when we keep running notes on different projects. Look carefully at the differences between Evernote Basic & Spaces to see if it is necessary to upgrade. It might not help you. It makes it easy to collaborate with students and other tutors for my business, but I used the free version first, and that seemed to be sufficient in communicating information/documents/links as well. "Loved the layout of this design and how it was available for mobile usage. Kept everything neat"
Easy to collaborate and be super organized with everything. There is not a single thing I don't like about the program. I love the interface. It's easy to use, clean, and you're in and out without too much hastle. Collaborating with a geographically dispersed team. The appearance could use some work. Even though it gets the job done, it looks bland and boring at times. "Makes collection, organization and sharing a breeze "
Bulky program can sometimes slow down machines. Note taking and sharing across disparate teams and groups. Easy to use; able to be used across any industry type. Nothing is disliked. The product is excellent. We we're previously using complex software. This is much easier of a platform. "Great program for collaborative work"
* We monitor all Spaces reviews to prevent fraudulent reviews and keep review quality high. We do not post reviews by company employees or direct competitors. Validated reviews require the user to submit a screenshot of the product containing their user ID, in order to verify a user is an actual user of the product. Hi there! Are you looking to implement a solution like Spaces?